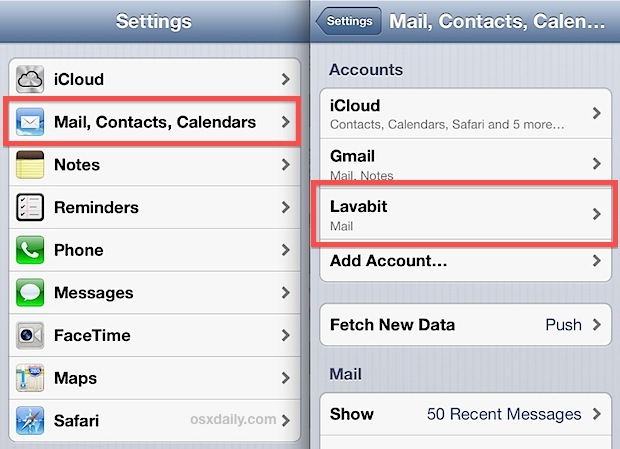 No longer want an email account on your iPhone, iPad, or iPod? Entire email accounts are very easy to remove from iOS, so whether you changed jobs, email addresses, an email provider was shut down, or perhaps you just don’t want to get emails for a particular account on your iOS device any more, you can easily delete the entire account in one fell swoop. It’s important to point out that deleting an email account removes all of its data from the iOS device, including any account specific mail settings, login details, drafts, mail messages, mailbox content, and of course, notifications and alerts for that account will no longer come through either. Be sure that is what you are looking to do before proceeding, otherwise you may unintentionally delete something you’d rather keep around on your iPhone/iPad. 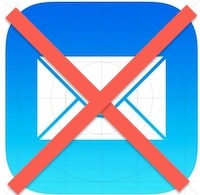 When you head back to Mail app and you’ll find the mailbox for that account is no longer visible, and you will no longer have the option of sending emails from that address in a new message composition or mail reply screen. There isn’t much harm in removing a mail account from iOS because you can always add the account back again in the future should need be. Because most commonly used mail servers store the messages on a remote server and then download them to your device as requested, those email messages will come back to the iPhone or iPad if the account has been re-added, so long as those emails (or the account itself) have not be deleted from the server as well. 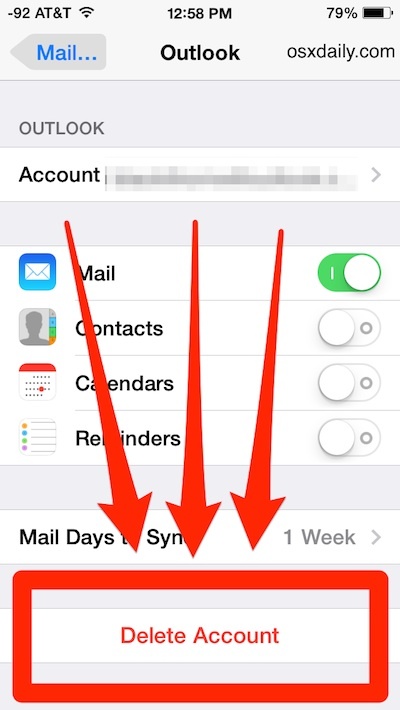 You can also delete and then re-add an entire account as a shortcut to removing every single locally stored mail message from iOS for that specific account, which with giant mailboxes may be faster than deleting a bunch of individual email messages in bulk the way you’re supposed to. Just be aware that removing an account to delete the messages locally from your device will not delete them from the mail server. 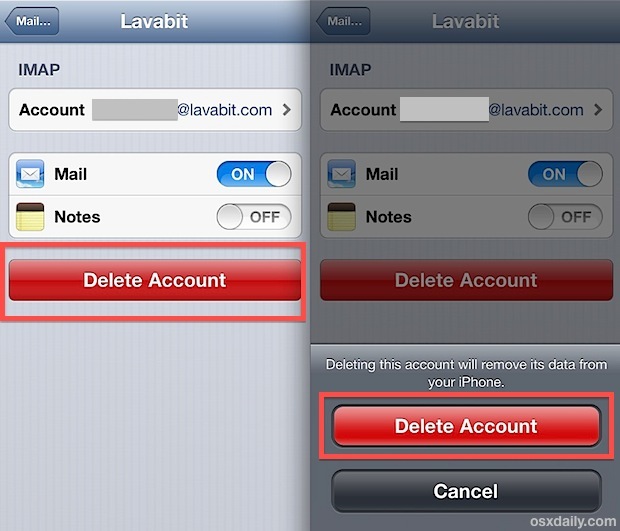 Will deleting the email account from the old ipad I want to give away delete emails on my computer and phone? Just want to be sure I still have all the old emails after I delete the acct on the ipad. A website called Daily Horoscope installed an email account on my phone unbidden. It provides no red Delete Account button! How to delete it? The Daily Horoscope email comes from an app called Daily Horoscope and it’s basically spam junkware added to the iPhone and iPad. The only way to delete Daily Horoscope email from iPhone is by removing that Profile. This is kind of up to Apple for allowing this type of thing to happen, it should not be allowed through the App Store if you ask me. Delete any “Horoscope” apps from the iPhone too, they could have related junk. Thanks a heap. This solved a problem that has been driving me crazy on my iPhone. Great getting your help. Great, Paul. It removed the unwanted mail account. Thanks. It worked for me too! Thanks for the information! Thanks Paul, that worked perfectly. Paul, I was losing my mind trying to get rid of a horoscope email account. You are my hero! I’m so glad I came across this post! Thanks again!! your solution worked for me in seconds. Thank you, Paul!!! Hubby clicked for a Daily Bible verse and apparently it created an email address & profile. Had no idea how to remove it. Thanks! I have deleted my email account from my iPhone numerous times as I was having problems sending emails. I have added my email account back to my iPhone numerous times and still have the problem that I cannot send emails from my phone. For the last week and a half I have tried to get my email account to send email from my iPhone. All of my correspondence has this email address on it. My emails work fine from this computer. Sending emails from the phone is the only problem!!! I am on assignment as an international travel writer in the Philippines. I need your help immediately!!! Please have someone reset the settings on this account. Paul, I join the others in thanking you for the guidance to remove an email account from the iPhones my wife and I use. It would seem to me that the problem you identified and provided a solution would be one that Apple would have identified, cataloged, and created threads for resolving. My problem came with the Weather Alert app issued by: COMODO RSA. The app not only delivered a daily weather message, but also created a steady flow of spam. I think is may have evolved from another NOAA Weather app I tired to use with out satisfaction. iTunes needs to do a better job of scanning their apps to keep this from happening. Once again, thank you Paul. So glad I found the solution to getting rid of that weather alert app that kept sending spam! Thanks! Thank you Paul AND Ed. When I joined a yacht club group I accepted Westher Alert thinking it would be good to know about the wave conditions. Then insane it created a mailbox without a Delete option and got nervous. No alerts, just spam. I hope I am not compromised. Thanks to you two, I was able to remove it. Is there a way to delete an account (or just turn it off) without deleting all of my messages? I have hundreds of emails I need to keep but the Accout is no longer valid. I want to edit an email account. I have a MSN email on my iPhone. I also have an alias email linked to that account (live.com). I still have access to all my emails and my sent emails, etc but I can’t send a email using msn.com. It only gives me live.com. The main email address simply disappeared. I tried to reply to a new msn.com email in my Inbox but now my only “From” option is live.com address. I didn’t change any settings. I didn’t update any apps or iOS. I want the msn.com back without deleting and re-adding the email account because I don’t want to lose my Sent files. Thank you for any advice. and selected mail. However, when I try to select specific email accounts that I can see listed they are “frayed” out and will never t let me select them. Suggestions? Many thanks this advice helped delete the email setup by Daily Bible Verse others have complained about. That site is now advertising on Pandora. Thank you Paul. This truly eased my worry. The Daily Bible Verse account is now fully deleted. Thanks for the help Paul. An email account named daily lotto was on my phone and there was no delete button. Thanks for solving it! I need to update an app but I don’t know/forgot the password for the gmail account to update the app. Should I delete the account? And would it be easier if i did delete it then make a new account then write the password down so I don’t forget it? I have an iPhone SE. Mysteriously an email account showed up on my phone. I did go in an disable the mail and notes under this account, so I am no longer receiving emails to the account. However, when I accessed the account via my settings tab and tried to delete the account, there is no “delete account” button. In its place is “These settings are installed by the profile “name of the email account”. How can I remove this from account from my phone? It sounds like the email account is added via a profile which must have been added at some point, perhaps through a job or an app. You’d need to delete the profile that added the email account. Go to “Settings > General > Profiles” and tap on the profile you want to remove, then tap to delete it and confirm. Note that removing profiles may have other impacts like removing calendars and some other features that may be related to a particular job or app, so be sure you want to remove the profile and what it relates to. My settings list mail, contacts, and calendar listed separately. I can’t figure out how to get to the delete option for my email account.